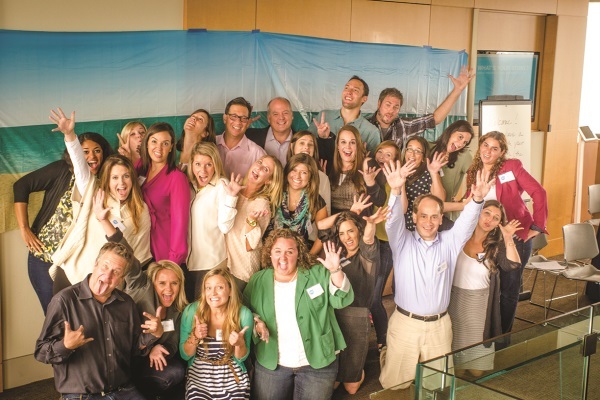 PRWeek unveils its list of the Best Places to Work for 2013. Cohn & Wolfe, part of WPP Group, received high marks from staff for work-life balance, business transparency, and employee-advancement tools. The New York-based global firm aims to create a culture that inspires people, fostering a work environment they are happy to share with family and friends. During the summer, the company held an '80s-themed party, while a recent social outing saw employees take the term “work-life balance” literally during a team-building exercise called the airplane challenge (right). Mock pitching exercises are offered to staff, along with work scavenger hunts, an internship program with varying social media components, rooftop parties in New York, and shadowing programs. C&W assists employees with mapping a career path that involves moving to other markets or work in other practices. The agency also offers a new online learning management platform and a number of “inspirational” global summits. Staff members can frequently snap up opportunities to attend conferences to enhance their knowledge and skills in specific areas. FleishmanHillard prides itself on giving employees regular interaction and collaboration with high-ranking executives, as well as other opportunities to learn and receive valuable career experience. Senior executives can be picked to attend Omnicom University, which is a two- to three-year executive-training program taught by professors from Harvard University. Employees say they value the firm's offer of sabbaticals, as well as the ability to work from home and flexible hours. “Fleishman's professional-development and executive-training programs with Harvard professors through Omnicom University really stood out,” one judge recalls. Many respondents emphasize that Fleishman gives staffers a clear path to the top of the ladder. Employees cite the firm's offer of viable ways to reach senior-level positions, consistent access to senior-level executives, opportunities to have greater authority over projects, and internal learning programs as examples of this. “Our mission is to become the world's most complete communications firm,” agency global CEO Dave Senay said at the time (above). The Omnicom firm also values diversity. In October, it named its second class of Alfred Fleishman Diversity Fellows, awarding 19 paid fellowships to college seniors, recent graduates, and graduate students as part of its Diversity Matters initiative. Weber Shandwick's tagline is “engaging, always,” and employees and executives treat that phrase as a motto and not just a marketing tagline. Asked about what makes the firm a great place to work, staffers cite salary and paid vacation, as well as the ability to work from home, flexible hours, and wellness programs. Others note that the agency goes out of its way to be a friendly place to work for employees with children, as well as small perks such as a well-stocked kitchen and a spacious environment that fosters creativity. The agency also earns praise for doing a good job of communicating internally. In terms of corporate citizenship, Weber staffers say the Interpublic Group firm is transparent and accountable, treats employees well, has a positive social impact, and contributes to a sustainable environment. The agency also got high marks from staff members for emphasizing creativity and collaboration in the workplace. Employees praise the firm for its mentoring programs and team-building exercises (left), and gave the company “excellent” marks for recognizing employees for doing a good job. “Weber's staff seem to have a great work-life balance, including work-from-home opportunities and emergency childcare,” explains one judge. Allison+Partners is defined by its unique workplace culture, built around a set of core values: to exceed expectations; be enthusiastic; empower others; offer a collaborative environment; and foster entrepreneurship. From its university program that instills these values at entry level, to its formal reward programs for employees that demonstrate these traits in their everyday work, the five values are intrinsic to the agency's output. While the workplace is fast-paced and committed to pushing the boundaries, the firm discourages competition that creates a negative environment. Allison has worked hard to create a non-hierarchical and inclusive environment and supports staff members looking for a different work situation with a full-time consulting program. This collaborative approach extends to different offices to ensure clients receive the best service. Judges noted that the agency's unique approach to P&L demonstrates this. The agency also prides itself on helping workers maintain a good work-life balance. As the agency continues to grow, the work environment is becoming more virtual. Allison offers staffers greater opportunities to work from home, but rather than introduce a formal one-size-fits-all policy for employees, the firm tailors this flexibility to the needs of individual staffers. Carmichael Lynch Spong's employees highly rate the PR firm's professional development programs, internal communications, and recognition of a job well done. With staff turnover of 17% and average length of employment lasting five years, the firm has a number of programs in place to encourage teamwork. This includes HeadRush, which one employee describes as “a professional-development program on steroids.” In the initiative, colleagues can work with supervisors to participate in customized growth opportunities by creating a HeadRush plan in addition to their on-going annual review. Staffers are given up to $2,500 for professional dues, memberships, conferences, and continuing education under the initiative. The firm's environment is designed to be open and collaborative (above) including a center stairway with landing pads to discuss ideas in passing and idea hubs on each floor, as well as gathering spaces to review work or read up on the latest trends. Carmichael also holds quarterly formal business meetings and weekly staff meetings. Beyond the traditional 360-degree reviews, merit increases, and promotions, Carmichael has an employee-incentive program called Going to Extremes. To recognize a job well done, each staffer is given a few dozen chips when they first start at the company. Employees can chip each other for going above and beyond and colleagues can turn in chips for gift cards. LaunchSquad has built a workplace environment that inspires creativity, while developing a tight-knit community of workers. Part of this is due to the agency's physical workplace, which scored highly with an open-plan layout that enables collaboration, as well as private booths to inspire creative thinking among staff (above). Internal communications is important for helping the firm maintain its values of open and honest communication among staff, leadership, and clients. This means LaunchSquad actively encourages employees to speak up and discuss their thoughts and ideas, no matter how big or small. Survey respondents noted great camaraderie among staffers who work well together and respect each other. Another defining characteristic of the agency is the recognition it gives staff for their work. There is a weekly open-floor meeting for employees to share and acknowledge hard work. At the end of the year, there are awards and bonuses, as well as the occasional on-the-spot-bonus for staffers that go above and beyond. With its farm-fresh produce delivery system, health club and sporting equipment reimbursement, book club, and lunchtime learning sessions, 360 Public Relations is far from an ordinary agency. The Boston-based firm, which focuses a lot of its internal efforts on professional development, offers workers PD Dollars to spend annually to attend conferences, seminars, and events that will help them grow and enhance their careers. Recently, the agency launched a running and walking program called 360 Fit. The firm also has an office bike (above) for staff to use. In terms of philanthropic efforts, workers say 360PR gets involved in the community, offering employees time to take part in charitable work and giving a percentage of the firm's revenue to charities. Last December, the agency dedicated its social channels to raise awareness of three organizations providing food, clothing, and shelter to those in need: New York Cares, The Home for Little Wanderers, and Share Our Strength, a 360PR client. The firm leveraged Facebook, Twitter, and Pinterest to engage fans for the effort. RBB Public Relations positions itself as being a workplace that is committed to treating employees well. A foundation of trust and transparency laid by management supports this system. Face-to-face time is highly valued within the agency and its open-door policy means staff of any level can drop by partners' offices and discuss questions they have. RBB's employees are kept in the loop with regular company updates and allowed to attend whatever meetings they want, even if they are out of their day-to-day scope. The agency's intranet also puts staff members in the spotlight. The Where in the World feature enables co-workers to share their location with each other at any given time, meaning if they are caught up in a meeting or an appointment, other employees know about it. This openness and transparency has helped foster a politics-free, family environment. The agency encourages social activities that build personal relationships between staff. Office space reflects the company's brand and is spacious and open, with designated areas for relaxation and fun (below). RBB offers flexibility outside of the office with customizable start and finish times for employees and provides cellphones and laptops to facilitate remote working. The agency offers wellness programs and sabbaticals for staffers after eight years of service. Having tripled in size and revenue since 2010, it's no surprise that Kwittken scored highly as having a collaborative environment that offers strong client services and a physical workspace with up-to-date technology. One judge thinks the fact that Kwittken offers two paid reading days per year, where employees can take time off to catch up on their favorite reading materials, is “one of the coolest perks” ever. The agency also has Kwittken Coins that are given out to staffers for good work, which can include getting a media placement or remembering to address an important issue with clients. Once a worker receives a coin, it's his or her job to pass it to a colleague for doing something worth recognizing. The agency has meetings where employees across teams can discuss and brainstorm ideas outside of client groups as a way to foster creativity. One of the firm's objectives by the end of 2015 is to garner half of its revenue from consumer lifestyle work. At the moment, that number stands at 30%. Kwittken employees often work with advertising agency partner KBS+, which gives them the opportunity to learn about other marcomms disciplines, such as paid media and advertising. Senior executives at Kwittken always make themselves available to staffers, aiding in work efficiency and mentoring efforts, survey respondents say. “[CEO] Aaron Kwittken treats his employees (above) with respect and wants to see them grow and develop,” notes one judge. AT&T Wireless offers employees a chance to grow professionally in an environment that emphasizes collaboration, work-life balance, and the importance of education. “It is clear that AT&T's staffers love the complete and very highly regarded benefits offered by this company,” one judge says. The organization is flexible when it comes to employees working from home. As of the end of 2012, about 22,500 staffers across 37 countries took advantage of the telecommute option. The company also gives employees the chance to interact with senior executives. “AT&T supports communications through several platforms including internal social media and an internal news source, AT&T Insider, that highlights news and stories that integrate employees more with the organization's brand and corporate initiatives,” explains one survey respondent. The company is committed to communications at all levels, from senior executives to people working in the field. During the past year, the company has made significant investment in next-gen platforms and tech that allow for messaging to be delivered to staffers, no matter where they sit, via laptop, big screen, and mobile devices. Diversity and inclusion are two other areas where AT&T survey respondents say the company excels. Last year, AT&T developed a Champions of Diversity Award, where it recognized 14 general managers across different business units for their impact on diversity at work and in its communities. Two important areas for AT&T are community involvement and philanthropic efforts, which rated highly among employees as having a positive social impact, contributing to a sustainable environment, and offering staffers time to take part in charitable work. Through AT&T's employee and retiree volunteer program, the company donated 5.8 million volunteer hours and earned more than $129 million for nonprofit organizations in 2012. Wells Fargo's communications strategy is comprised of sharing compelling stories, providing strategic counsel, empowering team members, and striving for excellence, the firm told PRWeek. And it excels in areas including camaraderie, philanthropy, and flexibility, surveyed staff members note. The multinational banking and financial services holding company has 265,000 employees, but its culture is one that fosters collaboration and great camaraderie, respondents say. Most staff members have developed both professional relationships and friendships with each other. One benefit eligible team members can receive is company-paid volunteer leave. Under the program, once an employee is selected by an internal committee, they are allowed extended leave for up to four months. For example, Wells Fargo corporate communications team members Wayne Thompson, Pete Fields, and Steve Kline (above l-r) worked together to pack supplies for Charlotte Bridge Home, a nonprofit that helps veterans transition home after military service. As a mobile company, Wells Fargo encourages staff to work remotely. Employees are supplied with the appropriate tools they need to work any time and place with mobile and remote connections. “Wells Fargo is one of the best companies at promoting a work-life balance, including the option to take a sabbatical for employees who want to volunteer long term at a nonprofit,” one judge explains. In addition, Wells Fargo provides opportunities for its corporate communications team members to innovate. Several pilot programs, both within the corporate communications group, as well as in enterprise-wide efforts, help to test and teach employees with new technology and shape enterprise and corporate communications strategy, policies, tactics, and training in social media. The company supports programs and organizations whose chief purpose is to benefit low- and moderate-income individuals and families. It also supports groups that work to eliminate the achievement gap in public education through curriculum-based or school-sponsored programs. The Chronicle of Philanthropy recently named Wells Fargo America's number one most generous cash donor. Submissions to Best Places to Work were judged by Jim Delulio, president, PR Talent; Lindsay Olson, founder, Paradigm Staffing; Lisa Ryan, MD, Heyman Associates; PRWeek's editor-in-chief Steve Barrett; executive editor Bernadette Casey; managing editor Gideon Fidelzeid; and Jennifer Cullert, VP, human resources, Haymarket Media, parent company of PRWeek.